The Columbus Railway, Power & Light Co. had to cope with some difficult restrictions on its streetcar operations. 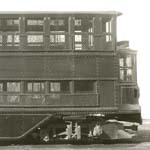 For one, from the beginning of the horsecar in 1863 until the streetcars were abandoned in 1948 they were rarely allowed to charge more than 5 cents for a ride which made strict money management essential. Up until 1926 all streetcars required a two man crew - motorman and conductor. Getting the most efficiency possible from those crews was critical. Another restriction, a majority of CRP&L's lines converged on the Goodale to State Streets section of High Street causing congestion, especially during peak traffic times that made it a challenge to keep the system on schedule. The congestion involved too many streetcars in such a short distance and the time it took to unload and load the cars. Double-deck car 1000 was another attempt to improve efficiency. It could carry more people with two crew members than any other streetcar. On paper, as you can see in Part II of the double-decker story, it looked like a winner. The car was used until the early 1920s and was scrapped in 1923. You would think from the old postcards and Columbus retro publications that there was a large fleet of double-deck streetcars in Columbus instead of only car 1000. A study by four Ohio State University Electrical Engineering students best describes the operational benefits and problems with the double-decker. It performed well enough that it stayed in service for several years. Yet, only High Street had enough patronage to efficiently use such a large streetcar and one was enough for the streetcar officials. Having noted all that, wouldn't it have been grand to be twelve years old touring High Street in the second story of 1000 on a mild 1914 spring day. Since the second story was a convertible car the windows would have been removed making it in effect an open car. As an experiment buying car 1000 was a success because it proved to management that double deck streetcars were not for Columbus, Ohio. To read the newspaper article about the 1914 double-decker study click here.